The deep sea microcosm and in particular the special way light falls on corals and all sorts of organisms had always interested me. Those images still amaze me and have become a theme in my work and an almost infinite source of inspiration. As an artist I investigate the forms of these delicate but tough creatures. The mathematical construction of motifs in nature marvels me and I try to portray this in my designs. I never sketch my designs but rather let the forms develop from a process. Sometimes it produces a shape that I didn't think up previously. The material tells me what it wants. Using glass, ceramics, porcelain, silicone, water, light and sound I build my own fantasy world; a utopia in which beauty dominates. I often use existing Latin species names to give a scientific foundation to my self created universe. The natural phenomena of symbiosis, “the joining of two organisms, often completely intertwined and mutually beneficial”, is an important reason to use two different materials together in one object. This combination of materials often works in an illusionistic manner. Is it glass?, Or actually silicone? Is it hard and fragile- or actually flexible and tough? It's challenging to make something apparently vulnerable yet tough and sturdy. 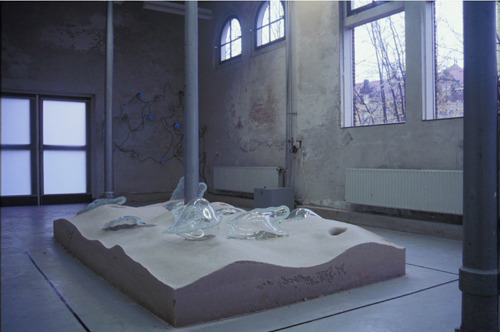 Several institutions have added my work to their collections, amongst which are; the Department of Justice in Den Haag, the Ceramic Museum Princessehof in Leeuwarden, the Dutch National Bank in Amsterdam, the Amersfoortse Insurance in Amersfoort and recently the national Glass museum Ebeltoft in Denmark. 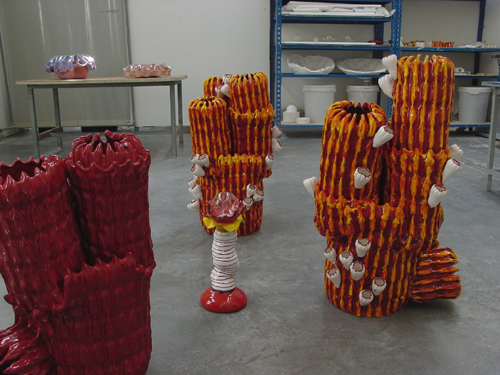 During a working period at the State Academy of Fine Arts in Amsterdam, I have tried to express this fascination by moulding glass in ceramic ovens. I put sheets of glass on an identical mould and used different techniques, such as bending, stretching and fusing. As a result of this, different forms emerged from the same origine, varying/mutating among themselves. Transparency and light lead to the burning in of luminous pigments in glass and the building of an installation in which sound and light came together. 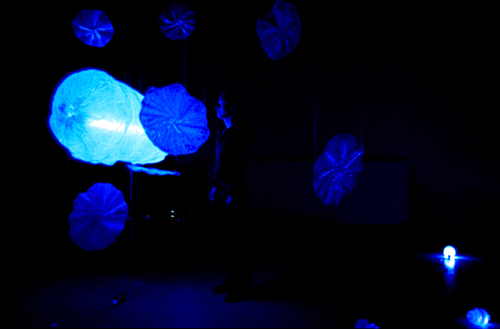 Light reacted to sound and illuminates the reflecting glass objects in the (deep sea) installation. During a work period at the European Ceramic Workcentre, I applied myself to the combination (symbiosis) of ceramic and glass, where I let the ceramic and the glass to bond in the oven. The glass bowed like a membrane over the ceramic form. 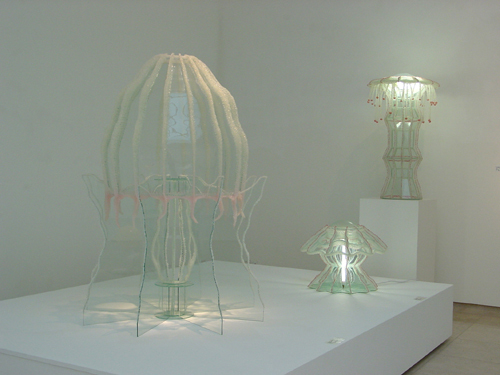 As a result, jelly-fish like forms emerged, with a colourful ceramic body enclosed by the glass membrane. Glass-blower Bernard Heesen blew some forms for me, whose shape I determined by making the silicon moulds. 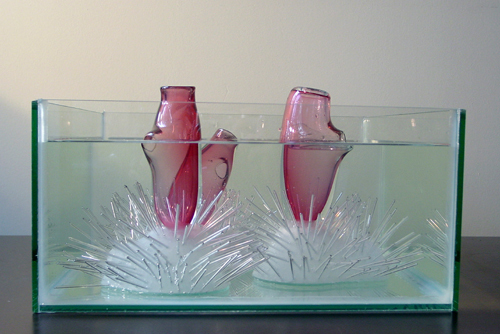 These blown glass objects I combined with silicon, glass-tubes, and glass-pearls and presented them in fish-tanks. During the periode that I had no oven at my disposal, I applied myself to the cold processing of glass. With the jelly-fish forms as premises, I calculated all peaces beforehand and build it like a three dimensional mosaic with silicon as an elastic connection. Because of the silicon, the inflexible glass object became flexible. Out of the fact that many deepsea jelly-fish are luminous, I have put fluorescent lamps inside. 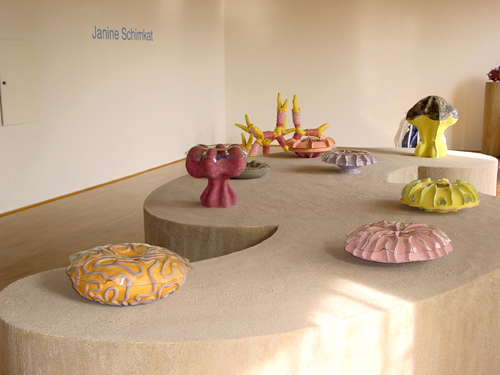 During a second work period at the European Ceramic Workcentre I concentrated on the structure and construction of a coral (reef). I started with moulds with a certain patern/rhytm. The forms that came out of these moulds I used as material to build branches like in a coral-reef. With bright glaze I represented the blaze of colours of the coral.